Weddings by Marty can host your Wedding Reception, Bridal Shower, Baby Shower or Quince/Sweet Sixteenth debutante celebration. Feel free to call me to customize and further discuss these events. Weddings by Marty can be the Master of Ceremonies for your Wedding Reception. I will work closely with the DJ and be responsible for the presentations, dances, toasts, cake cutting and formalities of the day. Let the DJ concentrate on playing good music. Marty will do the rest! 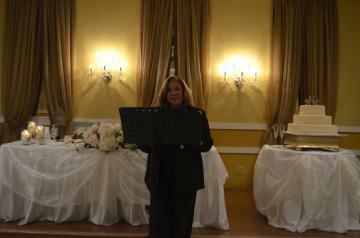 Weddings by Marty can emcee your Bridal Shower with fun games and activities to enjoy the event. Games can be: Bridal Bingo, Pass the Banana, Famous Couples Game, Hot Potato Game with the Bridal Garter, among others. Call me for Baby Showers too. As Master of Ceremony, I will read a "Welcome Letter" from the baby to the parents to be and guests, really loving and funny. Then we will have a toast to the new parents, followed by the luncheon and fun games, like: Baby Bingo, Musical Chairs, Feed the Baby, Fathers dress the babies and many more. Let's plan your baby shower. What else could be more fun than to plan your daughter's debutante party! I can perform simple choreography and MC your daughter's event to include: presentation of parents, presentation of immediate family members, debutante special presentation, dances with father, grandfathers, brothers, Rose Ceremony for mothers, Candle Ceremony with friends and family. Call me and let's plan ahead.